CRAIG LEVEIN admitted today he expects to have a huge fight on his hands to keep Robbie Neilson at Hearts. The club’s director of football also predicted several players will become highly sought after along with their head coach. For now, Levein has advised Neilson to remain at Tynecastle and learn more of his trade. Hearts’ record-breaking Championship title win brought Neilson his first league trophy in his first year in management at the age of just 34. He will lead his team into the Premiership next season with the intention of testing himself against the best sides in Scotland. Levein knows Neilson is already attracting admiring glances from elsewhere and, in time, he expects other clubs to come calling for the head coach and a number of Hearts’ best players. He hopes to keep Neilson for as long as possible, although he also wants him to progress his career when the time is right. “There’s Robbie, and I could name half-a-dozen players who, at some point, we’ll have a fight to keep,” said Levein. “But, going back to the beginning, the idea was that this is an opportunity for Robbie to progress his career. I said once before, and I regretted it, that I could see him moving on to bigger and better things. I really mean bigger things because I think this is a fantastic job for any young manager. I would want him to be ambitious. This season, with so many things going right, this probably sounds silly – but he probably hasn’t learned an awful lot. Levein acknowledged that Neilson’s first season has far exceeded expectations. Hearts won the league by 21 points from second-placed Hibs to cap a remarkable recovery less than a year after exiting administration. Neilson’s philosophy and football decisions have been a key factor. The pair have known each other since Neilson played under Levein aged 16 at Cowdenbeath. He later became a regular in Levein’s Hearts team. The gamble to promote Neilson from under-20 coach to head coach at Tynecastle was one Levein was keen to take when he became director of football last summer. 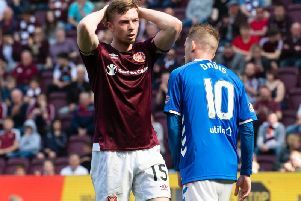 “I took him on loan to Cowdenbeath when I was there and when I came to Hearts, I put him on loan to Queen of the South and he came back to play a lot of games for me,” continued Levein. “I have bumped into him over the years. Everyone has their own idea about what makes a good head coach but for me it is pretty straightforward. The guys who have had to work hard throughout their footballing career because their ability is limited ... for a guy with limited ability he played for Scotland. “He is a problem solver, I know he is a good communicator because I know him as a person. He is honest and he had to work his backside off to achieve what he did as a player. There are some question marks like how is he going to do managing a dressing-room? I did my best to make that as easy as possible with the characters that came in and tried to give him the best platform possible to get off to a good start. He has exceeded everyone’s expectations by 100 fold. “Every time you put a manager or a head coach in place, it is a gamble. Every time. No-one can see into the future.